Did you know that the Vitamin C in your daily cup of OJ, that helps boost your immune system to fight off colds, has the same rejuvenating effect on your skin? Vitamin C is known to be a powerful antioxidant, so it’s great at reducing stress, the appearance of fine lines, wrinkles, and dry and irritated skin. You probably remember looking at the ingredients in luxury skin care products and seeing Vitamin C pretty often. Most of the top luxury anti-aging skincare products that help to rejuvenate the skin are very likely to have large amounts of Vitamin C listed in the ingredients section. But, do any of these products actually work, and is there any proof that suggests that Vitamin C can help to slow down the aging process? While Vitamin C does, in fact, have the potential to slow down the skin’s ability to age and help fight against fine lines and wrinkles, many of the products that include it don’t actually help your skin. This is because these products were not formulated well. 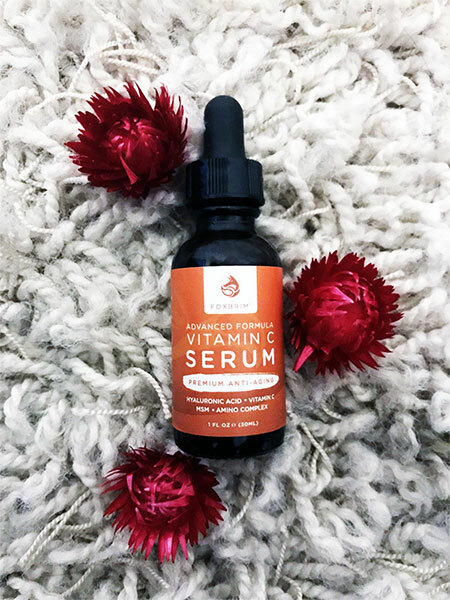 It is super important to find a Vitamin C serum that uses high-quality ingredients for you to get the skin results that you want, and so that you can stop wasting your money on products that don’t do anything at all. Even if you haven’t found the key to eternal youth, don’t worry. We are about to introduce you to the next best thing on the market right now. We have reviewed and featured products from the skin care company Foxbrim in the past, but none of that could prepare us for how much we enjoyed trying out this product. 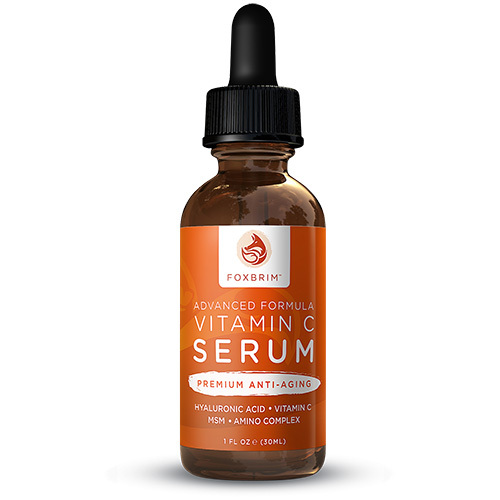 Foxbrim’s Advanced Formula Vitamin C Serum is an amazing product that incorporates six powerful ingredients to create the ultimate skin-building serum.This serum has a very effective formulation that doesn’t contain any harmful ingredients or fillers while taking all skin types into consideration. If you are asking yourself this, then you are probably unsure or hesitant about adding a serum to your skincare routine. Here are some things you should know. The majority of serums are a very lightweight and fast-absorbing liquid. They aren’t as lubricated or as thick as moisturizers and creams. The Majority of serums are either oil-based or water-based, and some serums are both. Serums are a lot more concentrated than moisturizers and creams because they have a lot less fluid in them. This means that they have more concentrated active ingredients in them. Aloe Vera: Aloe Vera is known for its anti-inflammatory and wound healing properties. The gel-like secretion, found in the leaves of the plant, have been used for centuries to treat first and second-degree burns and skin disorders. Auxin and Gibberellins are the two hormones in Aloe that are responsible for its anti-inflammatory benefits. Gibberellins also have skin rejuvenating properties that promote the growth of new and healthy skin cells. Vitamin C: We mentioned previously that Vitamin C is an amazing antioxidant. Ascorbic acid is what makes Vitamin C an anti-aging celebrity. It helps to fight against collagen decay and oxidative stress in the skin as we age. Dietary or topical consumption of Vitamin C are both beneficial for the skin and immune system, so it doesn’t matter how you consume it just as long as you do. MSM: MSM is an active sulfur that is critical for the production of collagen. Active sulfur is a necessary nutrient that keeps your skin flexible, energized, and looking young. It is also great at improving flexibility in the skin, joints, and muscle tissues. When MSM and Vitamin C work in conjunction with each other, they produce skin building and rejuvenating benefits to promote healthy tissue. Hyaluronic Acid: This natural ingredient is mostly known for being able to hold large amounts of moisture. But it also works as a skin stabilizer. Hyaluronic Acid is also used to lubricate joints and muscle tissue, and because it can retain collagen, it will help maintain your skin’s flexibility and elasticity. Witch Hazel: Witch hazel is an astringent that most people use to heal their skin. It is perfect to use on wounds because it can kill bacteria underneath the skin. It can also be consumed orally to help fight infection, swelling, and the flu. Witch Hazel is a natural astringent that has high amounts of antioxidants in it. Some people claim it to be the most effective acne treatment ever, especially since it’s also known to protect against skin cancer. Organic Jojoba Oil: This oil, that originated in America, was used by Native Americans for hair and skin care. It’s mostly used as a natural body lotion because of its unique similarities to sebum, a waxy substance that the glands in our skin produce. It can also seal in moisture very well and create a protective barrier over the skin to keep out unwanted external elements. It’s really easy to use. All you have to do is fill the dropper with the serum and then squeeze a few drops either directly onto your skin, or onto your finger into the palm of your hand. Begin to gently pat the serum into your skin using your fingertips. Pat, the serum into the skin and down your neck until the product, is fully absorbed. The answer to this question is everyone! You’ll be happy to know that this serum is great for all skin types. And yes, sensitive skin too! If you are looking for a product that is anti-aging and will shrink the look of pores and dark under-eye circles, then this serum will be great for you. It is also great for anyone who wants to give their skin a needed boost of hydration. MTF Hack: Mix the serum with your favorite makeup primer to help with reducing the look of fine lines and wrinkles and preventing your foundation from settling into them. Because it is soothing and slightly cooling, it will help reduce the look of pores, allowing your makeup to apply evenly over skin. Aside from having cute, vibrant recycled paper labels light reflective packaging, we love everything about the high-quality ingredients in this serum that come together to create a product that will allow you to finally stop your search for products that actually do what they claim too. And if for some reason you buy the product and hate it, Foxbrim offers a 100% money back guarantee on all their products. Also, the serum comes in a dark amber bottle that is tamper proof. This is important because it shows you how uncompromised the product is. We learned about the amazing benefits of using Vitamin C on the skin about a couple years ago, and have been using it ever since. Trust us. It will make a huge difference on your skin and will never have you looking back at your old skincare regime. 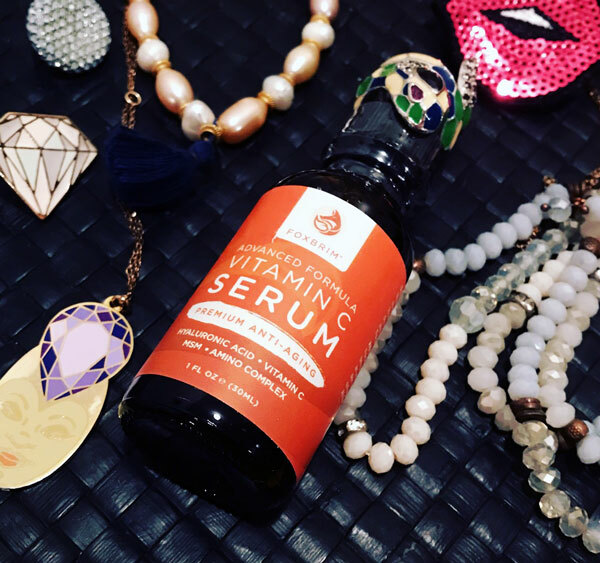 Many brands have their own versions of vitamin c serum on the market right now, and many of them are way to pricey and over hyped. But, this Foxbrim one works just as well (if not better) as any of the over priced ones, and is affordable too!